A Look Back After Seven Months! It’s hard to believe that we’ve been away from Tennessee for over seven months. I intended to write a reflection on the first six months, but we were so busy in August just keeping up with our travel blogs, that I didn’t have a chance. So this morning I’m sitting in a church parking lot at 6 am, unable to sleep, and thought I’d give it a go. We left Tennessee on my 66th birthday, Feb. 4, 2013 and spent that night and the next with old friends the Mayers’ and the Smiths in Durham, NC and Savannah, GA respectively. The third day we arrived in Florida to cooler weather than we’d expected, but our duvet-covered low-temp sleeping bag kept us toasty warm! We spent over a month in Florida before heading up to Brenda’s in mid-March to work on the cottage/garage they were building for my mom to live in. We were there until July 5, with two side trips of about a week each. Then we were with our Michigan children’s families for two and a half weeks before heading west. We also spent ten days at Art’s brother Bill’s, visiting their mom, who lives with Bill and his wife, for ten days in February, and spent a couple of nights with my cousin Judy near Orlando, and then visiting my brother Garry in July and brothers Jon and Steve during August. So altogether, we were visiting with friends and relatives for 140 days (through Sept. 4). We slept in Walmart or Lowe’s parking lots 37 nights, in church parking lots 5 nights, on the street 6 nights, and in National Forest or National Park campgrounds (under 0 a night) 23 nights for a total of 74 nights “on the road.” We also slept on the street while visiting my brother Jon, and in a church parking lot while visiting my brother Steve. For those of you who might be interested in how we’re doing this financially, or who may be thinking about doing something similar, our average travel expense has been $32.35 per day, which includes food, gas, tolls, auto expense, entertainment, and housing, and also money we gave to our hosts to cover some of those expenses. Of course the highest month was August, when we drove cross-country and used a lot of gas. That month it was $55.87 per day. The lowest was 8.10 when we were visiting family and not traveling much. Since our goal was to travel on $40-50 a day, I think we’re doing pretty well so far, and are far below the amount of our monthly Social Security, even with personal expenses added in. It has also been helpful that our church has been renting our house for the interim pastor to use, so our housing expense at home has been covered. In some ways, this trip has been exactly what we had anticipated, and in other ways we have been surprised. The time has gone a lot faster than we had imagined it would, and we are also surprised that even with “all the time in the world” there is so much that we have to pass by. We are following the seasons, so that compels us to keep up a certain pace, and we have also had pre-arranged times with family and friends that kept us to a certain schedule. During our time on the road we have driven as much as 200 or more miles a day to as little as 10-15 miles. But we have also made many stops along the way and have seen more amazing things than many people see in a lifetime. We have driven 10,237 miles and have used 653 gallons of gas. Understandably, gas has been our biggest expense, but what we’ve saved on restaurants, campgrounds or hotels, and admissions (LOVE the senior pass! ), has more than made up for the extra gas, and has enabled us to stay on budget. We have also realized that our experience is not at all atypical. While we haven’t seen many folks with exactly the same set-up that we use, we have seen many who are traveling full time in one way or another. We are traveling in primitive style, compared to folks with trailers and RVs, not to mention people who stay in motorhomes or hotels. But we are traveling in luxury, compared to car campers, whom we often see in parking lots where we stay, and to bikers (both bicycles and motorcycles), hikers, and backpackers. 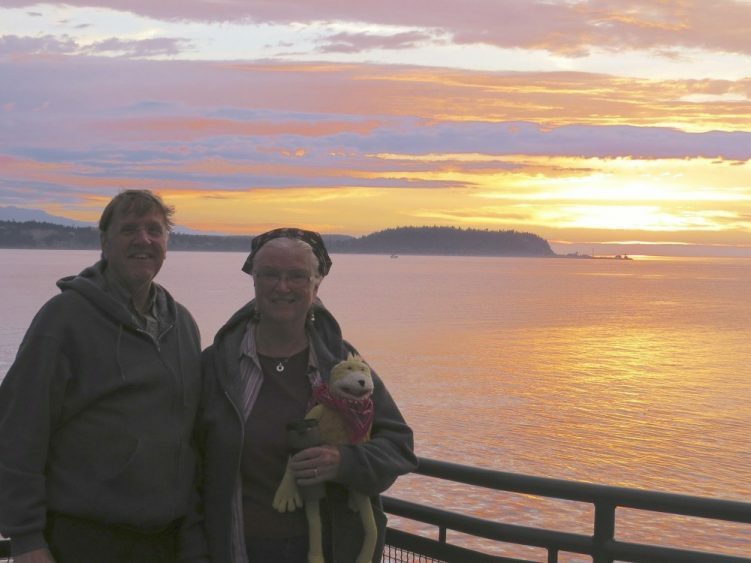 We have met many folks along the way, who are unfailingly friendly and helpful, loving to share their experiences in travel or to help us get to know the area in which they live. We have also enjoyed getting to know many brothers and sisters in the family of God, as we visit churches each Sunday. It’s great to have “instant family” to worship with each week. And we love hearing their stories too. And of course there is our natural family as well. What a privilege to visit all three of my brothers and their families, Art’s brother’s family, and his mom, and soon we’ll be visiting Daniel and Dia for the first time in their California home. We are truly blessed and thank God every day for the privilege of taking this trip.